I figured I would give this guy his own post so I could add a few more pics about him and explain how I painted him. The day I saw this model, I loved it. For a plastic Librarian, I think he's great. I saved this guy for last when it came to painting as a way to reward myself for finishing the rest of the set. He's painted up to match the White Dwarf version with a couple minor exceptions. Being blue sets him apart from the rest of the Terminators, but the bigger issue is how he is painted. He's much more "high contrast" than the red models. Everything I figured out when it came to painting the red was no good at this point. Since I didn't know how GW painted theirs, I had to sort of make up my own process as I went along. I started with a light grey primer and then a real dark blue as the base color. Once I had that down in a smooth coat, I started with blending in the slightly lighter highlights around all the edges of the armour plates. That's the point I'm at in the pic above. Then it was a wash of GW Asurmen Blue to tone that all down a bit. 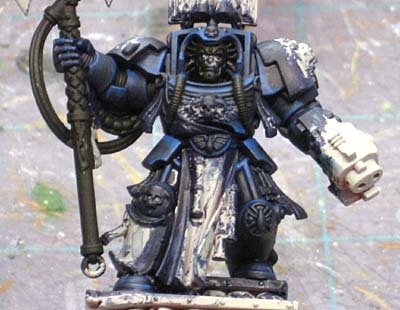 With that dry, I went in with a bright blue and carefully highlighted just the edge of a few key armour plates to draw attention to his face and chest. The actual model has it all over, but I wasn't going that route. This guy was supposed to be painted to tabletop standard to begin with, but I wanted to see how close I could get in matching the feel of the White Dwarf version. Then I went back and cleaned up some highlights with the first blue and left it at that. The freehand scared me at first. I put it off until the very end. That and the blade on his power weapon. Between the two, the freehand worried me more. I got real lucky with painting it. 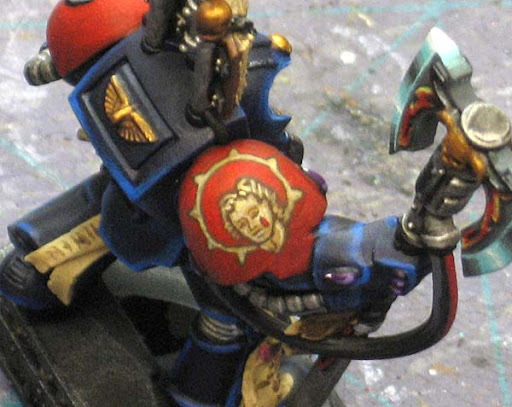 The shoulderpad was complete when I started, meaning the shading and highlighting were all done. Any mistakes would be real tough to fix at that point. One of those things where you get one chance to paint it right or you start all over from the beginning, no saving your work half way. I blocked out the whole shape with dark brown first. Then I went in with a middle value tan and blocked out the interior shapes (face, neck and hair shapes). Then I went in with my dark brown again and added the lines on the face. Then it was a matter of taking a light tan and adding the highlights to the hair, forehead, cheecks and neck. Sorry, no step by step pics since I was frantically painintg at this point and had a number of colors out that I was switching back and forth between to get the right look to the face. All in all, it took about 15 minutes to get it to the finished state. This is what my workspace looked like towads the end. I usually have the middle clear, but I was working so quick that I ended up pushing myself out of my own work area. You can duplicate the White Dwarf "look" of models if you're willing to take the time. I don't understand why they paint some things the way they do, but that's another story I suppose. This guy too a solid afternoon of painting to do. Power weapons look best when you give them a little attention. The technique for this guy's weapon required 3 colors with 6 blends in a span just over a half inch on both sides of both blades. You really need to be patient when working out something like this. Washes are great. The cloak he's wearing started as an insanely bright pink color before I added the series of washes and then went back in and highlighted it. Success in the end, but I wasn't sure when I started. Just a little bit of freehand can make a model stand out. It doesn't have to be complex either. Something simple and clean is all it takes. Even a decal will work. All in all, I really like this guy and would love to get my hands on one for my army. Don't get me wrong, I love the metal Terminator Librarian as well, but I much prefer playing with plastic. This guy can use a good bit more work to get him up to speed as there are areas that are "lacking"... but for the purposes of the game and fitting in with the rest of the models in the project, he fits the bill perfectly. If you guys have a question about how I did something on this guy in particular, I'll try my best to answer it since I didn't post many WIP shots of him. Love the dark blue and the axe blade. What colours did you use for the paper/scrollwork? Outstanding work Ron! I love what you did with the Power Axe! What did you use for the dark base color? He looks stunning, especially the axe. Great work! I like the darkness of the blue... it makes it look like he is stalking the dark corridors of a space hulk for sure! Great job ron, eventually I hope to be as good at painting as you are. Andy: The paper/scrollwork are just a tan color (Fawn by Americana)followed by a Devlan Mud wash. Then I go in with dark brown and add the text. Sometimes I'll go back with the original color and "highlight" it. Big Jim: If you're asking about the axe, it was painted the bright green color as the base(Turquoise by Delta Ceramcoat) and then I went in with a dark grey (Storm Grey by Delta Ceramcoat) and blended that and then went in with white to blend the highlights. I wanted to ask a question about your paints if you don't mind. I've only used GW and Vallejo paints on miniatures. How do those Americana and Ceramcoat paints compare? Tom: I think I have three GW paints. The rest are all Americana and Ceramcoat. As far as comparing... they might be a bit thicker than their GW counterparts but once you get used to the consistency, it's no big deal. And there is such a huge range of colors to choose from. Ron did you take this guy to adepticon by any chance? CURSE YOU! That guy looks great. I'm currently working on some SH Termies and this really inspires me to do that little bit more on them. I particularly like the NMM on his blade. Thanks for the colors, I may try this technique out. 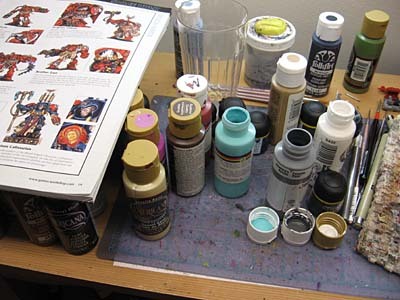 I too use a lot of Ceramcoat and Americana paints to supplement my Vallejo paints. They are fantastic for stains and washes. 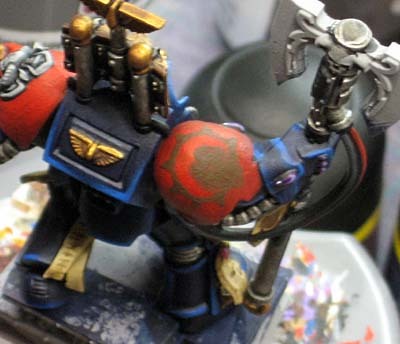 That freehand shoulderpad is fantastic. Wow so many things to love about this model but the freehand on the shoulder-pad and the blade on the power weapon really stand out. Crimeny, this guy is so made of win it's not even funny. 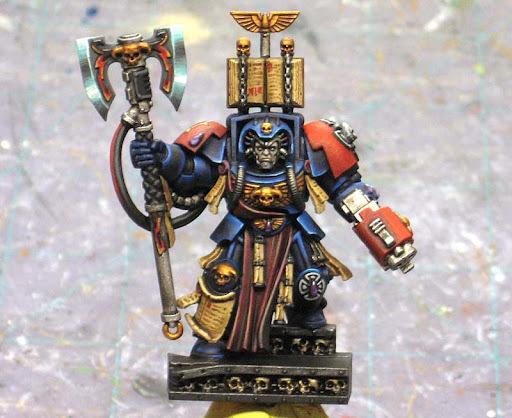 He honestly looks more badass than most of the other Librarian models GW has put out. Major Kudos on this one. Do you thin down you Folk art and other brand paints or do you use then straight from their bottles? 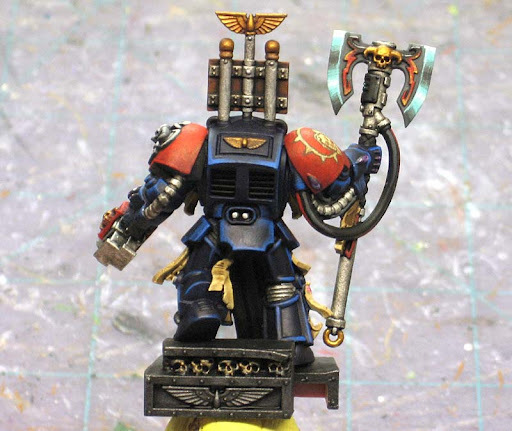 Gratz of the freehand painting – looks sweet – as does the power axe. It's amazing what time, patience, and pushing yourself out of your comfort zone can achieve – if only I did it more, haha! Thanks guys. His owner loves him and he definitely stands out from the other Terminators in the set. Rogue Valley Minis: Nope, I only wish I could get out to Adepticon. Howard: Sometimes I'll thin them if I'm painting detail work (like freehand) but I usually use the stuff straight out of the bottle... mainly because I'm lazy. Love the Axe blade. looks really great. Ron.. I'm going out on a limb here... but you didn't happen to be at Adepticon this year? In Chris Borer's paint class on Friday night? That scroll work and freehand on your libby looks amazing, and its ringing a bell too... as is the color of his axe blade. If you aren't then my apologies, and serious kudos to you for a fantastic looking marine! gah... teach me to not read through all the posts... you weren't in Chicago.. ah well. still an awesome looking marine! Paint My Figs: Thanks, I tried to get it as close as possible to the pics in White Dwarf when they had their showcase.